Skid marks. Granules of shattered safety glass scattered for 80 feet along both sides of the road. An indicator light indicating something it was not intended to. Drive safely, folks. 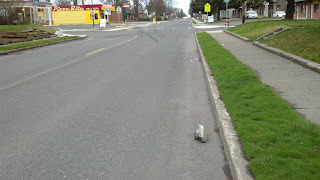 Failure to do so leaves hazardous debris for bicycles to avoid. And the obviously more serious consequences. I don't understand why drivers are not required to clean up after themselves.